In PR, knowing market trends is a foundational element of doing business. In the last few years, nothing has made a bigger impact than the expansion of Social Media. “Social media is a rapidly growing communications outlet that has proven to be effective in increasing a company’s brand, awareness, relationship with its’ audience and ultimately sales,” said Dana Castle, principal and director of strategy for Function:.These trends aren’t just rumors—they are studied and analyzed by people who want to understand market changes. Facebook was recently named the most popular website in the United States, with users spending an average of seven hours a month on the site and over 50 percent of users logging on at least once a day. A Harvard Business Review study concluded that businesses that create fan pages on the site have noticeably higher foot traffic and overall business. The architecture and design community, where Function is most invested, is not blind to these trends and seems to be increasing their visibility on these sites daily. 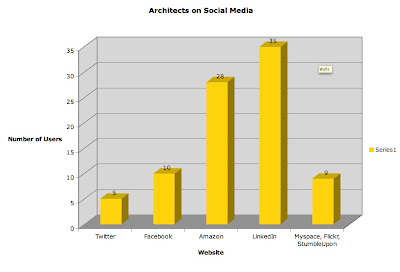 Recently, Function: conducted a study of the social media habits of over 600 architects. The study revealed that 10 percent of architects are active on Facebook, five percent use Twitter, 28 percent use Amazon’s social features, and 35 percent of those surveyed are on LinkedIn. The less popular social networking sites like Myspace, Flickr and StumbleUpon account for another nine percent. 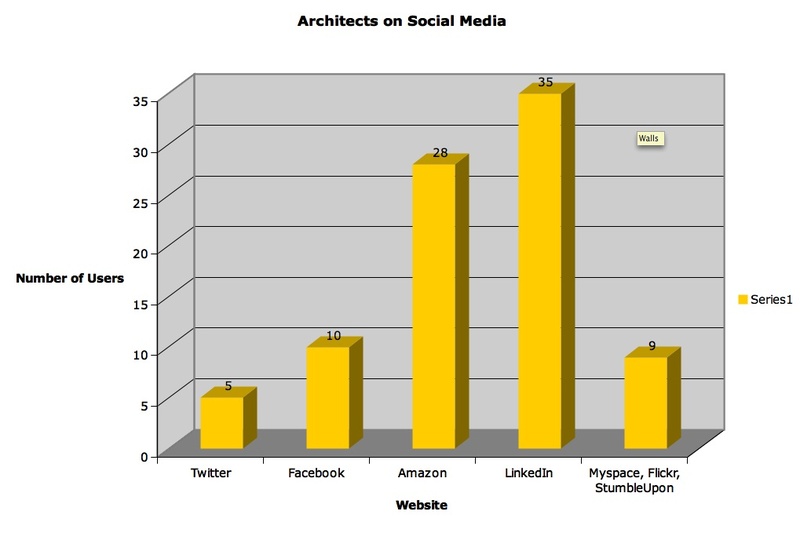 The results of this study indicate that architects continue to focus social media usage on sites that are targeted on generating professional connections, with LinkedIn holding the most participation. The upward trends of architects with accounts on Twitter and Facebook shows an active interest in larger community engagement and the increasing appeal of sites with multiple social, professional and business-related purposes. “The key to successful social media is in knowing your audience,” said Dana. “For Building Product Manufacturers, this means understanding what social media outlets architects or contractors are using, why they are using them and the messages they are interested in receiving. Function: specializes in reaching these audiences and can connect manufacturers to their influencers in the right way. For more information on how you can reach your target audience via social media, contact Ted Hettick (ted@functionatl.com). One thing that we are all short on is time. It seems that 24 hours is never enough and our lives continue to get increasingly busy. When it comes to our jobs, we all want to learn, succeed, share knowledge and experiences and meet with our peers. For many in the architecture, engineering and construction (AEC) industry, building codes, trends and even materials change or are updated so often that connectivity is critical. And let's face it, in today's economy staying on top of your game and networking are crucial. Conferences are great for helping people connect to other industry professionals. But, they can also be time consuming; often requiring travel, conference fees, transportation expenses, etc. At Function: we realize how busy you are, so we’ve created a new sort of “meeting of the minds”: Function 140. Hosted via Twitter, it's an online conference where you can quickly hear others thoughts (in 140 characters) and share your own. Log in and out all day long. Bring up whatever topics interest you the the most. You're the expert. Not to mention you can search the tag #Function140 to track the conversation! This will be an open forum on Friday, April 16, 2010 starting at 10am EDT. A place where architects, buidling product manufacturers and others can share ideas, ask questions and get to know each other a little bit better. We will discuss topics including product specification, LEED, BIM, retrofit and more. 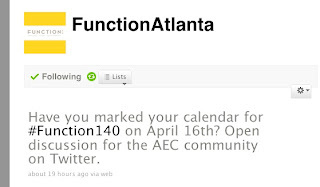 Using #Function140 as a hashmark, we’re hoping to create an informal, easy place for everyone in the AEC industry to connect and talk. 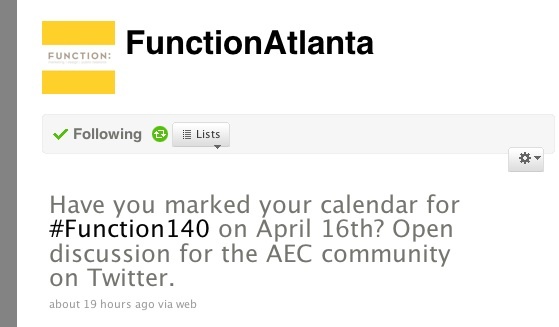 As the date gets a little closer, we’ll tweet to remind you, so make sure you’re following us @FunctionAtlanta! ICC, ANSI, ASTM, ISO, ASHRAE - the string of monikers floating around in the world of building codes is a long one. And on March 15, another acronym was thrown into the mix with the introduction of the IGCC, or the International Green Construction Code. This measure, launched by the International Code Council (ICC), offers a much-needed simplification of the green construction process. In what BuildingGreen.com calls “a first step to greater integration,” the IGCC is the newest standard for green building codes that will minimize confusion and speed up the process for commercial development of high-performance green buildings nationwide. The IGCC, using the ‘model’ code approach, incorporates elements of existing codes to standardize requirements for energy efficiency, water use, environmental quality and impact of the building on their communities. Compatible with Standard 189, a set of pre-established building codes, as well as voluntary ratings like Leadership in Energy and Environmental Design (LEED), the IGCC offers an unprecedented streamlining of green construction regulation across the United States. Designed with local, state and federal law in mind, this measure will work as an overlay to the ICC Family of Codes and will account for local conditions. A press release from the American National Standards Institute contends that the launch of the IGCC is “the most significant development in the building industry in the past 10 years.” Indeed, it appears that the introduction of the IGCC marks a new era in the construction industry, indicating that sustainable building has become the norm for establishing building practices in the US. The IGCC reflects the goals of the AIA 2030 Challenge by using mandatory language that provides a new regulatory framework. Additionally, it offers both performance and prescriptive solutions to help builders striving to meet regulations. While the construction industry’s alphabet soup of acronyms, agencies and regulations may remain elusive, we’re fairly certain that in years to come, the IGCC is one we won’t forget.